It is August already?! What happened to the summer? It is quickly coming to a close but the first Wednesday of the month means Winner Wednesday. Today I am giving away my newest product, Christian Reward Tags. I created Catholic reward tags for my religious education class last year and absolutely loved it. I got rid of my treasure box and haven't looked back. Reward tags (also known as brag tags, behavior tags, STAR tags, etc.) are a classroom management technique that focuses on positive reinforcement for appropriate classroom behavior. While my Catholic reward tags are more specific to a Catholic school or after school program, my new Christian reward tags are more generic to be used in a Christian school, Sunday school, Vacation Bible School or even homeschool setting. Some of the tags about behavior could even be used in a traditional classroom such as I showed cooperation, I showed courage, I showed responsibility, etc. To get reward tags ready to go, I print them out, laminate, cut them apart and hole punch. I then group the tags together so they are ready to go before the year starts. It takes time and the money for supplies but it ends up being cheaper than filling a treasure box and the kids are so excited to earn these tags. This set comes in color and in black and white. I usually print in color on cardstock but they are just as much fun if you print them on colored cardstock to give them a pop of color. Do you want to win a set? All you have to do is enter your name in the rafflecopter below to be entered to win. A winner will be chosen and emailed in the morning. Also, make sure to check out the other Winner Wednesday products that you have the chance to win. 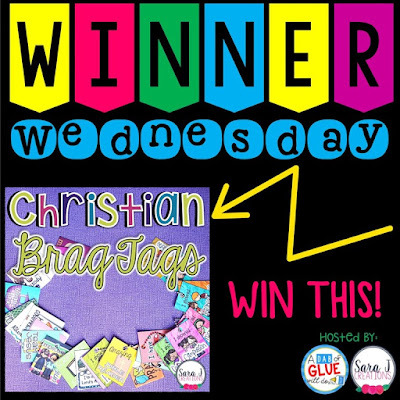 Didn't win but still want to grab Christian Brag Tags? Just click HERE. These look perfect for a Catholic classroom. Great choice with schools starting back up soon! I have brag tags for my class but have been looking for some good Christian ones. Thanks so much. These are great! You are so welcome! I'm glad you found them! Hope your students love them!